Happy Monday!! I hope ya'll got out there and got some great runs in! I can't wait to start training again!! 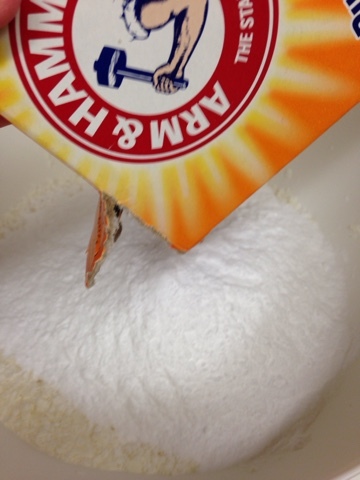 This weekend, I made my own laundry detergent and it's quite simple really! It makes your whites so much whiter and you only need two table spoons! 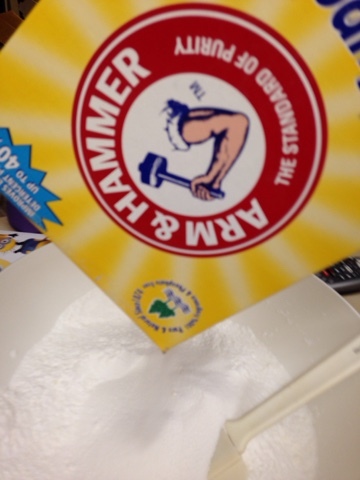 This stuff can be used in your HE machine as well because it is low foaming. I have been wanting to make my own for over a year now and have watched/experimented with borax, but am not a fan of all the chemicals! Additionally, making your own can save you a lot of money! I bought 2 5 oz bars of Dr. Bronners unscented Soap. Our store didn't have any more in stock, so I used an additional Kirks Orginal Coco Castile bar to make up the difference! 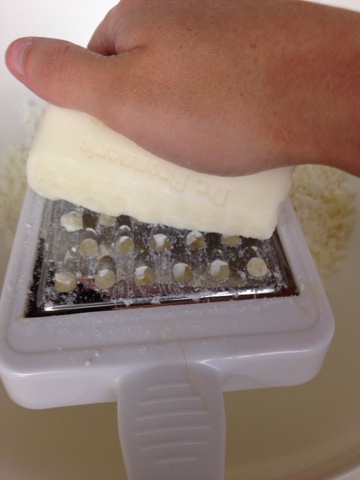 First, you grate all of your soap bars. I used a cheap cheese grater from the dollar store. 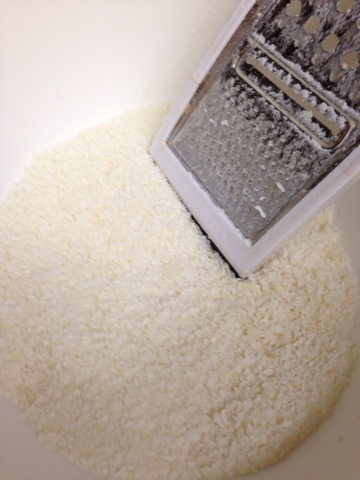 You could use a food processor or anything else that would make it into small pieces/ flakes. I put all of this into a large bowl. Next I mixed the baking soda in. 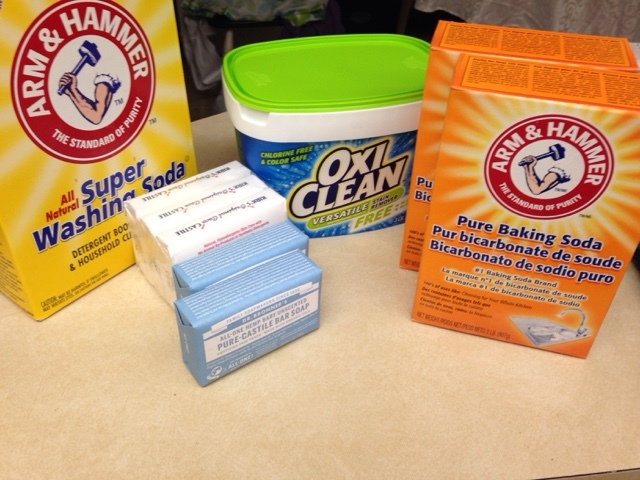 I stirred all this together and then added my next ingredient, which was the Arm & Hammer.. There was a lot of stirring going for a while because I wanted to get things mixed up really good. 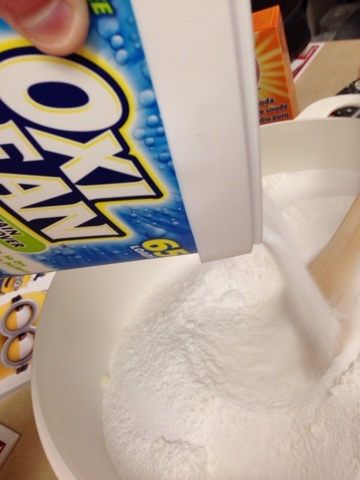 I then added the OXI clean, which was another huge thing to stir! I didn't think I would be able to add the Epsom salt into my giant bowl, but it proved me wrong! 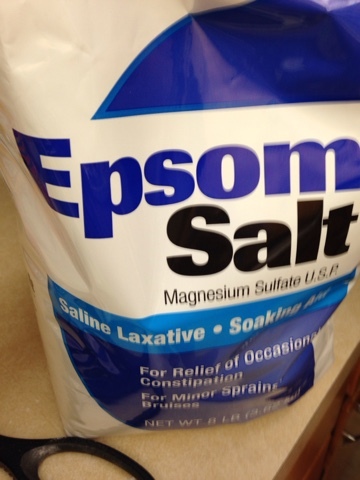 I was also able to put my 26 ounces of Epson salt in the bowl as well! Overall, I have a lot of detergent and I used it already! Wow, it makes my whites a lot whiter! I'm sure you could find it cheaper, but my two soap bars were pretty expensive and I like that soap. The Kirks 4 pack is how much 1 single bar costs for Dr. Bronners. Look for sales if you want to make this cheaper. I am going to keep track to see how many uses I get out of this reciepe! You only need two Tablespoons! I'm thinking this will give me around 300 loads if not more! 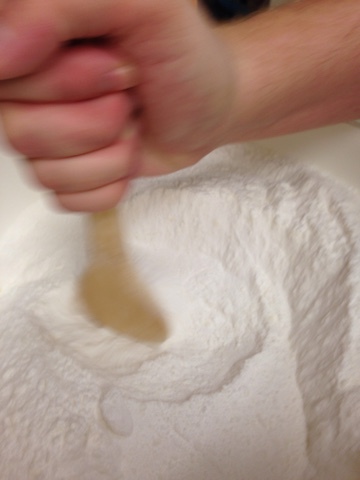 Q: Do you make your own laundry detergent! Suggestions? Thoughts? It's great! I used it on my running gear and it made them smell fantastic! That's awesome! I've always read about doing this but haven't attempted it yet! I would be interested to see how many loads you get out of this! So far, 15!! And counting! !